The past has opened its eyes. Experience the harsh brutality of forced trafficking and experimentation on both women and men in Nazi Germany; take a deep breath as chaos, drip by drip, is unleashed in the streets of London of today; follow the twists and turns of fate along the roads, towns and cities of Southern and Central Europe as the story transports the reader into a world where trust is sometimes an illusion and where brutal characters play mercilessly with people in their power. Yet amidst the darkness, there is love, hope and light. But nothing is at it seems. It never is. So are you ready for the truth? But no one really wants to know the truth do they? Life’s easier that way isn’t it? Their biological father died in Auschwitz. They were created in the Petri-dish. They were born to be murderers. They just didn’t know it. But the others in the Network did. In 2012, Tom, hoping to see Claire, he is ready to confess, returns to England for a long weekend. He stays longer than he ever imagined. Thanks to Harry. Fear walks the streets of London. Unrest is only a heartbeat away. Death is merely a matter of time. Thanks to the other one. In a desperate struggle to uncover the truth, Claire unwillingly stumbles across the history which is infecting the present and all of our futures. The genetic envelope has been opened. There is no turning back. 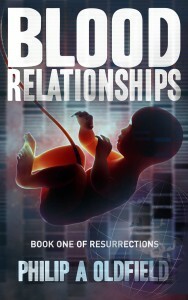 There are 3 themes explored in Blood Relationships: Faith, Gay Prejudice and Genetic Engineering. I was brought up in the Roman Catholic faith. I wanted to explore how an individual brought up in the faith – who is in training to become a priest – might react when his beliefs are brutally put to the test. I also wanted to explore how, based on one’s faith, a decision might be made when faced with a moral dilemma. Lastly, I wanted to illustrate how a person might struggle between his vocational calling and that of his longing to be with a woman he loves. My maternal uncle was gay and lived with his partner from around the 1950s. When I was 10 years old, whilst my father was dying of terminal cancer, I lived with them for 6 months or so. It was not until I was older and more aware of the differing nature of relationships that I realised they were both gay. They had been together for over fifty years, a testament to love. However, for a large part of their lives they must have had to keep their relationship hidden from the public eye. History shows us that prejudice against people can come and go, and sometimes, come back. In Blood Relationships, I wanted to show how prejudice and ignorance and also upbringing can cause so much harm, hatred and fear, when above all, society needs humanity to treat others with humanity. Hence the story weaves in tales around the nature of love, of blind hatred, of nurture’s influence on perception and behaviour and how people might show support through one massive march for Pride to demonstrate how acceptance, tolerance and love really can restore faith in humanity. Blood Relationships draws on the long history of eugenics and the desire to improve the human race. I have taken historical events from the Nazi era in the 1930s and 1940s and also drawn on the genetic experiments of that period which focused on artificial insemination, the freezing of sperm and embryos and on the array of IVF trials on rabbits and also on women. The science and the history used are all described at the end of the book. In my view, the envelope of genetics is forever being stretched. Today, I believe that advances in technology have outpaced our ability to forecast the real consequences if used. For once genetic markers have been identified and located in a particular gene, ‘healthy,’ ‘enhanced,’ or ‘defective,’ genes can be introduced into the petri dish at or shortly after the zygote stage. Thereafter, these transgenes create genetically modified individuals. The alteration is known as germline genetic modification. Changes genetically modified may only become apparent and switch on when an individual matures into adulthood. If not rendered infertile, the genetic modifications will be replicated in their offspring. Blood Relationships posits a future born from the past, from the decline of the Third Reich and its desire for renaissance through new life created in the petri-dish. Blood Relationships is but a glimpse of this world, of the impact on a small number of individuals caught up in the unfolding of events and of hints of chronicles yet to come. The books characters were born primarily out of the three themes for the book, which are described under the reasons I gave on how I was inspired to write the novel. I have also included references to historical characters from World War II. The book blends the 20th and 21st centuries and hence the nature and language of the characters is adapted to the era in which they live. Below is a review by a UK Amazon reader, which you may find illuminating about the story and why she found it so enthralling. It was nearly three in the morning. The floor was of marble quality. The polished tiled surface inversely reflected Tom’s body as he lay like a discarded puppet in the corner of the cell. Masking tape covered his mouth. His arms were bound behind his back, tied at the wrist by a plastic strap. His legs were shackled together by two steel rings around his ankles, which were joined together by a metre long rubber bungee. Ventilation was provided by a large fan, flush against the wall in the uppermost part of the cell. Harry had made sure the fan was large enough to do the job. To force air in or alternatively, force it out – all of it. He had made sure, for the comfort of his prisoners – his humour was rarely funny – that heating could be provided at a comfortable temperature from under floor pipes that ran the length and breadth of the cell. Harry was pleased. He was proud. He was excited. This man was his very first inmate. Tumbling the now unconscious inebriated body out of the car had been easy for him. Harry was big and had carried the man over his shoulder into his converted home, a warehouse. Harry had undressed the man and had applied the restraints. In comparison to Harry, the man had nothing physically to admire. But it was the man’s mental attributes that intrigued Harry. The more so since his wallet had revealed that one, Tom Abimelech, 29 years of age, was on the verge of becoming a Catholic priest. Harry needed to spend some time to think through how he was going to dismantle this man’s character, this man’s mind. In the meantime, the monitors all showed that Tom was alive and that his body rhythm had settled into a heavy sleep. With one last look on the screen, he could see that Tom’s body remained still; the silent humming of the fan provided the only movement to accompany the scene below. Everything was as it should be. Perfect, thought Harry. With that memory for company he left for Tom’s hotel, confident that his systems would monitor his victim’s welfare and record any sounds, whilst the restraints would prevent any harm coming to him, yet. The distant hum of the mosquito whirled consistently in his head. If only Tom had remembered to draw the net around the whole of the bed, then he wouldn’t be the subject of the insect’s next blood feast. He awoke with a start as he fought to swat the insect away. It was then that he realised that he couldn’t speak and that his legs and arms were constrained. He could hardly move. Tom’s eyes opened a fraction and allowed a flicker of light to enter under the veil of his eyelashes. His eyes focused on the wall fan – the mosquito he wondered. His brain was thumping; hell’s head was twisting inside his skull. He was trussed up, and was stuck – a fly in a spider’s web. Tom whispered his prayers fervently. ‘Holy Michael Archangel, defend me in the day of battle, be my safeguard against the wickedness and snares of the Devil and by the power of God, thrust down to hell Satan and all wicked spirits that wander the earth for the ruin of souls. Tom’s eyes now opened wide and flicked from side to side. To his right face down he could see clean white tiles stretching away from him in all ways across the room. Against one side stood ominously a polished stainless steel adjustable height mortuary table, above which, flush against a wall, hung surgical instruments. Next to this was a counter, sunk within it was a white ceramic sink, the base bulged out underneath as if displaying a pregnant stomach. Rearing their ugly heads above the sink, loomed large stainless steel long armed taps, idling, and waiting to be used. A flexible wall mounted hose pipe with a spray attachment was curled up asleep. The walls appeared opaque and lifeless. Apart from the fan, there were no other sounds. Tom twisted his body and rolled onto his back – this is not happening; this is a mistake, his thoughts pleaded for a welcome reality to replace this clinical cage. His body weighed heavily on his arms and he could think of nothing except the pain of the straps cutting into his skin. He groaned through the cramping agony and with Herculean effort, writhed and struggled upwards, using the wall as a prop, until at last, he sat back, almost upright against it. He looked up and a number of thick steel rings, much like the ones used to hold bulls, were embedded near the edges of the ceiling. Fear breathed its cold spell into the room. He was naked – this is obscene, the thought was like a klaxon in his head. To restore some circulation, Tom moved his legs gently up and down. The movements were slow, as if he was on a treadmill for the elderly. The floor had an ambient temperature making the room comfortably warm, although the word comfortable did not remotely enter his mind. His bladder felt uncontrollably full. No one came. He hung on, until drugged inspired sloth overcame him and he slept. Urine gushed over his legs and onto the floor. At first in a sweeping torrent then followed by the slow fragmented ebbing of a river drying up from its source. Tom awoke and found himself lying in the warm waters of his humiliation, and sobbed.